Friends of Science climate change video billboard in Montreal, Quebec has been challenged by a You Tube video by La Chorale du Peuple or "The People's Chorus." The Friends of Science small budget digital campaign has also been met with a rebuttal letter to the editor of the Montreal Gazette and a statement from astrophysicist Yvan Dutil in Montreal Voir. The Friends of Science iTrix video billboard, the only video billboard of its kind in Quebec, in downtown Montreal on the corner of St. Catharine and Drummond, is the subject of an amusing spoof music video by "La Chorale du Peuple (The People's Chorus), published on YouTube on Dec. 2, 2014 under the title of "Blamons le Soleil" (We Blame the Sun). By contrast Friends of Science reject the premise of a letter to the English-language Montreal Gazette of Dec. 2, 2014 by Binh Au Vu Van, president of the Quebec Association of Science Communicators (ACS). Friends of Science point out that their own billboard campaign was intended to inform people of the sun’s influence on climate change and pique the interest in a more robust discussion. The Montreal Gazette letter is marked by statements like the conclusion: "We should all firmly denounce this type of disinformation. It is not welcome; it will not be tolerated." Friends of Science point out that freedom of speech and expression is enshrined in the Canadian Charter of Rights. 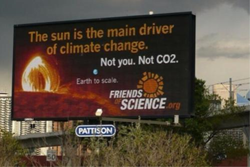 A vigorous climate change statement made by astrophysicist Yvan Dutil in Voir Montreal on Nov. 25, 2014 argued against the Friends of Science billboards that claim “The Sun is the main driver of climate change. Not you. Not CO2.” (carbon dioxide) closing his argument by using a temperature graph from a blog that ends at the year 2000. Friends of Science questions the lack of current data from a reliable source and say global cooling has been in progress since at least 1998 with a visible trend drop after 2002. 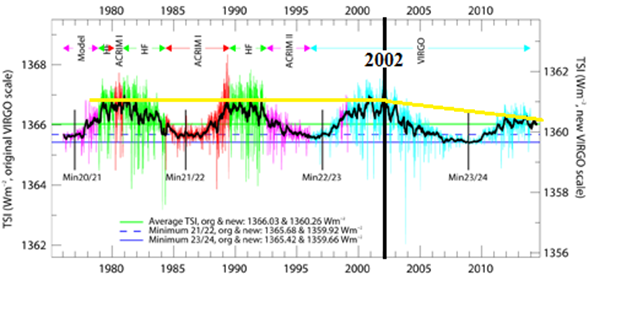 Dr. Ross McKitrick illustrated the trends in his Friends of Science luncheon presentation in Calgary on May 13, 2014, and they are consistent with the World Radiation Center observations of dropping solar irradiance say Friends of Science. In Quebec, ACS has put up some counter billboards claiming that “science has spoken the truth”, and that “we are the cause of climate change.” The billboard shows back-lit billows of steam from an unidentified industrial stack. “It is ironic that the ACS who are putting up billboards to counter ours, make a non-scientific claim,” says Kalmanovitch. “They claim climate change is ‘our fault.’ Why do they use the term “Le climat change” (which means natural climate change) instead of the official “Changements climatiques” (selon la CCCC)?" Friends of Science recommend that people review the hundreds of peer-reviewed scientific papers supporting the Friends of Science statement that the sun is the main driver of climate change on earth. 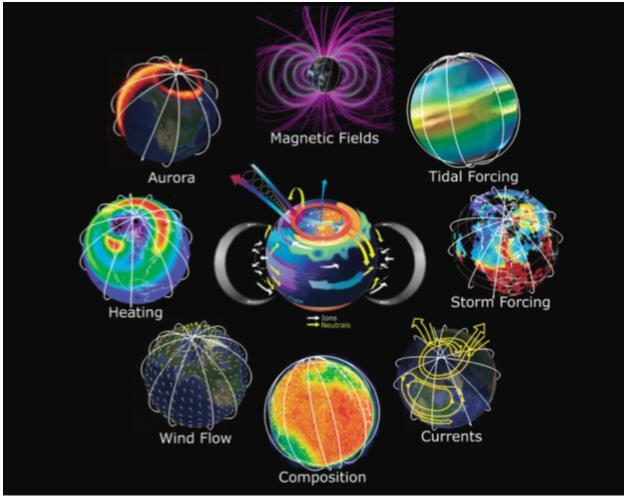 NASA’s Solar Dynamics Observatory is constantly feeding new information about solar activity and its repercussions as outlined in a NASA Science News report of Jan.8, 2013; this was prior to the publication of the IPCC report that global warming had ‘paused’ despite a rise in CO2.